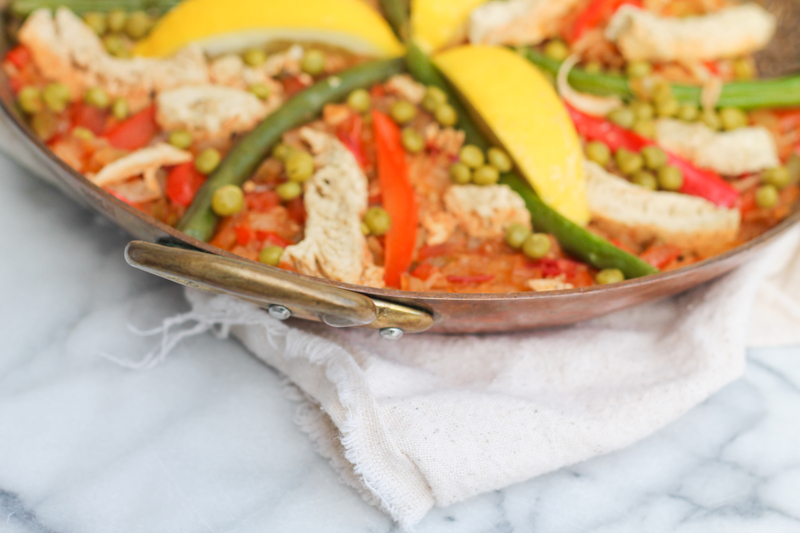 Vegan Paella recipe - inspired by our Spanish Travels! Inspired by our travels through Spain in the past year, I’ve recreated the traditional paella but in a plant-based version. 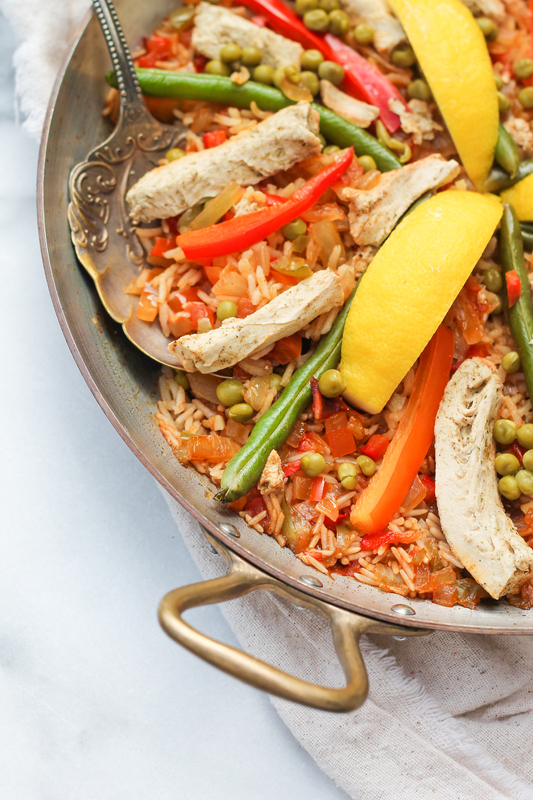 Packed with vegetables and the option to include “mock chicken”, this Vegan Paella is flavorful, delicious, and a great option for weekends when you want to treat yourself to something delicious and healthy! Vegan Paella, you might ask yourself – is it paella at all? I’m here to tell you that YES! As long as you’re using the classic spice of saffron, and you’re using the correct technique, this vegan paella is just as delicious as any other paella – and as I learned in my paella classes in Barcelona, there’s no right way to make paella, as every region, grandmother, and restaurant makes it differently. Let’s start with the important spice, Saffron. 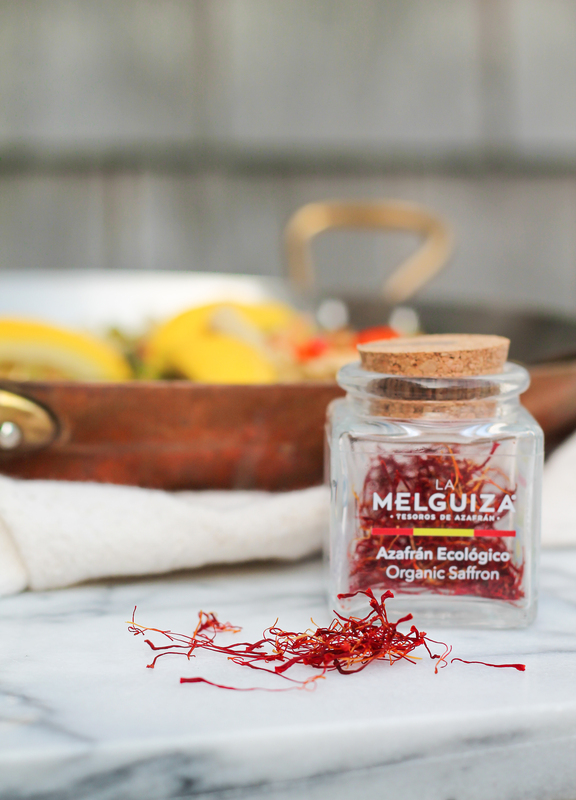 Saffron, ones of the most coveted and most expensive spice in the world, is king in Spain. It’s the one food souvenir I knew I needed to bring home, and as luck would have it, I stumbled upon a saffron shop that had organic saffron! La Melguiza, located in the Santiago neighborhood (C/ de Santiago 12), between the classic Opera zone and the very popular San Miguel Market, has a showroom and shop that sells their amazing saffron products and the star of this vegan paella. Paella de marisco, known as paella by the tourists coming to Barcelona, is one of the most acclaimed dishes all around the city and the country. A rice-based dish, known worldwide and cooked all around Spain, paella was born as a way to use the fish and seafood in the villages near the sea. Every region in Spain has developed its own paella, cooked with the ingredients that they have on hand, being fish, seafood, meat, poultry and even game. Practice makes perfect! Every Paella is Authentic…In Its Own Way! Like with any other recipe, you can adapt the recipe to your liking and that’s what I did here – having had seafood and meat heavy paellas in Spain, I wanted to try out a vegan version. You can definitely make this recipe using all vegetables, but I found at my local store some vegan chicken slices in the frozen foods aisle and definitely thought it was a delicious idea to incorporate for a bit more substance. Our chef instructor really made sure to tell us – sure authentic paella is said to be found all over Spain, but in reality, every paella is authentic because every region of Spain, every family, and every grandmother in Spain makes paella a tad different, and who are we to say one is more authentic than the other? So have fun in the kitchen – that’s what it’s all about! This vegan paella is everything you've dreamt of and more - flavorful rice packed with vegetables and a splash of wine and saffron make it divine and my go to weekend meal! In your paella pan, over medium high heat, warm up the olive oil and sauté the onion, diced pepper, garlic, tomato, paprika, and saffron for a few minutes. Once all this is translucent, about 5-10 minutes, add the rice and mix to coat the rice in the oil and vegetables. Pour in the vegetable stop and the salt and pepper, and arrange rice in one layer, as you reduce the heat to your lowest setting, letting the rice cook undisturbed for 20-30 minutes until cooked. Once rice is almost done, sprinkle the peas, place the sliced red peppers and green beans, the chicken, and cover for 5 more minutes to warm everything through. Serve immediately with a sprinkling of fresh lemon or as is. I just love this recipe. Thanks for this post.